It flies around inside your house, ready to respond to any emergency, to ward off any intruder, and even to feed your pets when you’re away. No, it’s not your own overly-attentive superhero. It’s an Aevena Aire drone, a milestone of the future of home security. Dubbed a “flying security guard”, Aevena’s latest sky-bound security device is like one of those automated robot vacuum cleaners, but instead of cleaning up dust, it cleans up security risks. This indoor drone is just one of the latest developments in the smart home security world, which is increasingly blurring the lines between the real world and Hollywood Sci-Fi. But with so many DIY home security products on the market, is there a risk we could end up less safe than we were in the days of the simple lock and key? Aevena’s Aire has not yet hit the market. It launched on Kickstarter in September, with a tentative release date of December 2018. The drone has proven popular on the crowdfunding platform, reaching its funding goal of $50,000 in just four days. 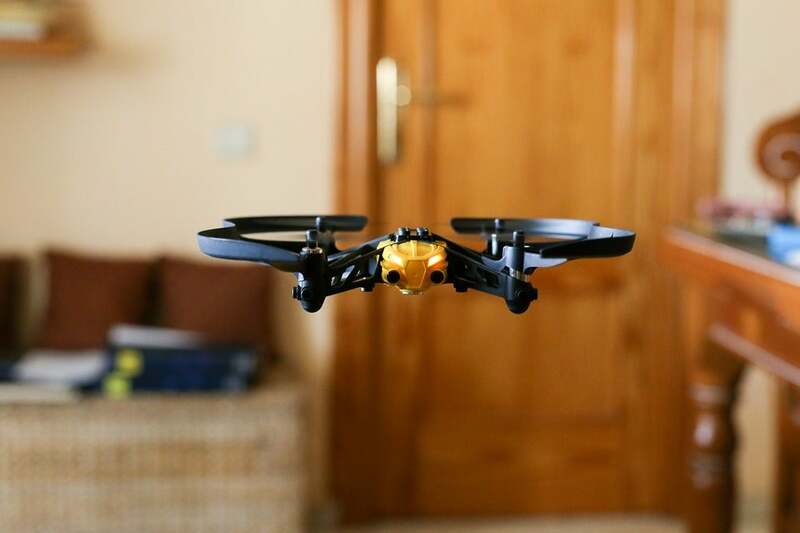 Four users have even ordered the “Triple Pack”, which gives backers three drones for a cool $1,950. At this stage, it is difficult to say how popular these devices will be with the everyday public, but integration with Amazon Echo’s Alexa is sure to attract many safety-conscious technophiles. Amazon themselves have had their eye on the burgeoning smart security market for a while now, as an inside source leaked to the Financial Times that the online retail giant is working on security accessories for the Amazon Echo home assistant. These accessories reportedly include CCTV cameras, the feeds of which users would be able to view remotely. Since Alexa is slated to be a $10 million ‘mega-hit’ in just a few years, its security accessories may prove to be the most successful bits of smart security kit in time. It’s not just the inside of the home that is experiencing a smart security upheaval. Smart locks, such as these new ones from August, can use sensors to inform owners whether their doors are locked, unlocked, open or closed. They can also “auto unlock” for anyone carrying smart keys. August has a smart doorbell on the way, too. Equipped with a tiny camera, the Doorbell Cam Pro will send a live feed of the outside of an owner’s home to a mobile phone app, allowing them to keep tabs on their porch, wherever they are, and use the information to decide whether to let callers in. There is also Ring that is designing a complete security “ring” around your home. All of these home security innovations sound exciting, and buying them will no doubt make homeowners feel more protected. But as nearly all of them are intended to be DIY-installed, there is a risk that they might be less effective than they seem. Security experts Banham specifically take issue with DIY-installed wireless burglar alarms, pointing out that while laymen can install burglar alarm systems themselves, they are very likely to make mistakes, and these mistakes could endanger the property. Even when buying futuristic high-end smart security products, it’s important to get confirmation from an expert that your home as safe as it can be. Another downside of these new smart security developments is their cost. Most products at the moment cost more than the average household would want to spend on home security, which could have dire consequences. Unless prices come down, there is a risk that we could end up in a world where the houses of the rich are protected by high-end drones and smart alarms, while the houses of the poor are left relatively unguarded. Finally, while these drones, apps, and doorbells are impressive from a gadget geek’s standpoint, there is the possibility that they may not be as effective as their technical superiority suggests. A smart doorbell may be able to show you exactly who is outside your door, but it won’t stop them from bashing it down if it’s not made of strong material. A home drone may be able to fly in a burglar’s face and trigger your home alarms, but it won’t do much more than a traditional alarm system already can. The most effective solution to our security tech worries is a combination of the traditional and the futuristic. Strong doors and strong locks monitored by CCTV cameras that stream to mobile phones. Grounded human security teams working with their airborne drone counterparts. This new home security technology is exciting, but we will have to use it wisely for it to work. The Opera browser has unveiled loads of new features including a built-in cryptocurrency wallet, support for Web 3.0 applications, and a new dark mode. With the browser already packing a built-in VPN, it's a genuine Chrome competitor that's well worth a free tryout. Though it once seemed a luxury, wearable tech has now blossomed into a must-have accessory for a wide range of consumers. Smartwatches and fitness trackers aren't going away, and the wearable tech market is only set to grow further in the coming year and beyond. Samsung has announced plans to launch a new, affordable, mid-tier tablet that could rival the iPad, and it's thinner and lighter than any tablet on the market. Take a look at all the information we have on the Galaxy Tab S5e. Simon Davies is a London based freelance writer with an interest in startup culture, issues and solutions.